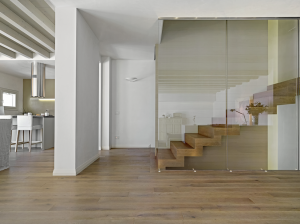 Stairs can be much more than a functional element in a space to get you from each floor. Stairs can also provide an opportunity to make a bold statement and an impacting divide in your space. If designed right they can also create an enjoyable experience of moving throughout the space. A successful staircase is one that sits well with the overall layout and style of your home. It can either blend in or it can have the opportunity to be a major feature within the space. First decision you have to make when considering a staircase is how you want the staircase to work within your space. Form and location of the staircase are very important as they have a direct impact on convenience and functional usage of the staircase. The type of a staircase is also your next consideration. Each type of staircase will vary depending on the style and size of the household it has to suit. Straight Stairs – Basically a straight flight. Simple, yet convenient and functional. Quarter landing stairs – Quarter landing stairs are a variety of straight stairs including a landing, which changes the direction of the flight by 90 degrees. Half landing stairs – Half landingsStairs are also a variety of staircases with straight flights. Just like quarter landing stairs they also have a landing, but here it changes a direction of the flight by 180 degrees. Winder stairs – Winder stairs are the stairs with a turn by 90 and 180 degrees. Single winder stairs – Single winder stairs are stairs with a turn by 90 degrees. Double winder stairs – Double winder stairs are stairs with a turn by 180 degrees. They are more compact than Single Winder Stairs. Spiral stairs – Stairs of this type have stair flight resembling a circle or a part of it in its shape. The treads are wedge-shaped. Compact stairs – These are stairs occupying a minimum space in the house. Quite often they are called “goose-step” or “sambo” stairs because of the distinctive shape of their treads. Arched stairs – Arched stairs are the stairs with a flight resembling an arch in its shape. Stairs are complex. They are an integral part of any home, they are also very costly and because of this every level of the staircase design is important and deserves your consideration. Every staircase has to be designed and built with a strong structured support system. If you design the staircase with interesting structural elements make sure it’s not competing against any other elements in the room. This way the detail of the staircase stands out as a unique feature. If you want to create a bold statement I suggest adding a colour to the stairs. A bright colour can make a striking feature against a neutral palette. Note: If you have an open plan living space I suggest adding in gaps between the stairs this way it gives you a view throughout the room and provides natural light between each step. 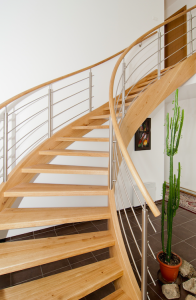 If your staircase is to be in a high-traffic area, the materials you choose need to be durable and hardwearing. I would steer away from paint on your steps as the paint will peel and get damaged over time. If you decide to install carpet consider how easily it can be removed and replaced. As stairs can have potential for people to hurt themselves you will have to follow BCA regulations. Make sure you adhere to these Australian Safety standards. The handrail should run the entire length of the stairs and be smooth with no breaks. 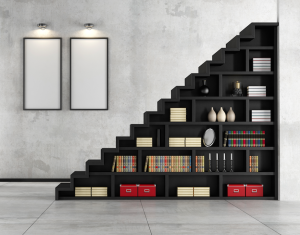 With today’s urban living environments space is precious so try utilising your stairs into storage savers by converting the gaps in between the stairs as a clever bookcase. The unused area under the stairs is also a great storage space or closet.